This is a combination of a the Simple Double Knit Headband and the process of creating a reversible pattern for which I found some instructions on this page at Giftable Designs. The construction needs some work and I neglected to follow the final slipping instructions for the headband. 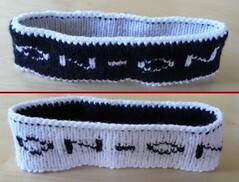 The headband is too big and the cast on edge is stretchy and larger than the bind off which doesn't have much give. It was a learning experience nonetheless!